Score Draw England 1998 Home Shirt. Beckham's red card, Owen's virtuoso goal vs Argentina and England losing on penalties (again). 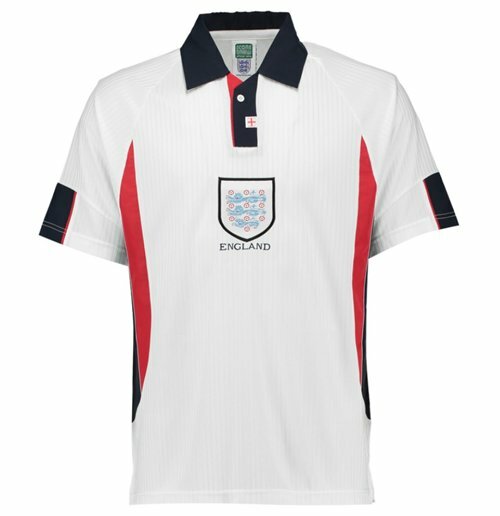 Re-live all the dramatic action in the England 1998 World Cup Finals Retro Football Shirt.Made by Score Draw from polyester, time may have passed and wounds healed but the memories come flooding back and that's before you've even pulled on this England football shirt. There's no skin tight, performance fit here as it's a much more baggy affair straight from the 90s. Sporting a shiny finish to the white and a navy finish to the rather large collar, which was all the fashion at the time, the Three Lions badge sits proudly in the centre while the St George flag features on the buttoned neckline.